Las Vegas Car Accident Attorney - You Pay Zero Unless We Win! For most people, a car accident is a rare event. It can be difficult to know what to do, what your rights are and how you can get the settlement you need for your injuries. That is why we offer personal attention to every client at Koch & Brim. Our Las Vegas car accident attorneys have handled auto accident cases throughout our 45 years of combined experience. How does Nevada compare with the rest of the nation with motor vehicle fatalities? 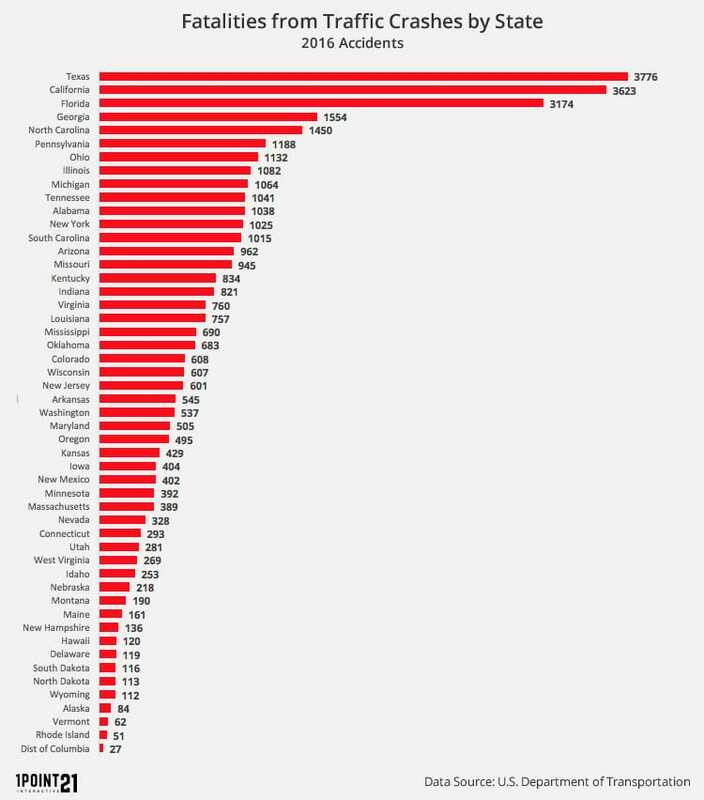 In the following chart you can see a breakdown of the traffic deaths in all states across the U.S. According to the data compiled by the U.S. Department of Transportation, Nevada is ranked #34 in the total number of motor vehicle deaths in 2016. The total was 328 fatalities for the year. When clients call or come to the Las Vegas personal injury lawyer offices of Koch & Brim, LLP after an automobile accident, they are looking for answers. How can I get my car fixed? How can I get medical treatment? How can I get a fair settlement from the insurance company? There are different answers for each unique situation. Property damage: Our law firm can explain how to make a property damage claim and set the process in motion to get your vehicle repaired quickly. No health insurance: You need to seek medical treatment immediately. If you do not have health insurance, contact our law firm. We can arrange treatment with a competent doctor – even with specialists – so that you can get treatment and begin your recovery. Health insurance: If the health insurance company does not want to pay for your treatment, we can help. We will contact the medical insurance company and give them the information they require to process and pay your medical bills. Accident investigation: Most auto accidents do not require an investigation, but if there is an issue about how the accident happened we will hire an accident reconstruction expert. That should be done as quickly as possible, while the evidence is still fresh. Wrongful death: If a loved one was killed in an auto accident, you have our sympathy and our help. We will do everything we can to provide family members with compensation from every source possible. Tourist accidents: We represent out-of-state clients who were injured in an auto accident while visiting Nevada. Our Las Vegas Car Accident Attorney team can help you win compensation for pain & suffering! No recovery, No Fee. If you were injured in an auto accident, contact the Las Vegas car accident lawyer team at Koch & Brim, LLP. We can answer any questions that you might have, explain your rights, and make the entire process easy. Remember: No recovery, No fee. Contact us today at either of our convenient Las Vegas locations. Call us at 702-451-3900 for a free consultation!